The newest in Sony’s electronic family the Sony VAIO CW Series Notebook PC is one of a kind. The style of plain black or silver is becoming a thing of the past. You can now express yourself with color options and high expectations from the workings of the Sony VAIO CW Series Notebook PC. Not only are they beautiful, but also they are built for speed. The VAIO CW Series Notebook PC have something for everyone with great graphics, threading technology, turbo boost, and has the ability to work two tasks at the same time. The focus of the Sony VAIO CW Series Notebook PC is work horse, which is easy and stylish. The Sony CW Series Notebook PC produces some of the best graphics seen. The notebook features a dedicated NVIDIA ® GeForce ® graphics card with 256 MB of dedicated video RAM for boosting 3D gaming performance and day-to-day operations. This notebook makes working with HD video, large image files or graphic induced applications easy very easy. Not only is the VAIO CW Series Notebook PC a great application computer, but it serves as a great entertainment computer. Enjoy HD entertainment anywhere. The notebook has the capability with its blu-ray technology you can choose your favorite blu-ray disc to watch and enjoy. The picture has unparalleled quality with incredible sound no matter where you end up watching. With the type of technology this VAIO CW Series Notebook PC uses; you can watch and play CDs and DVDs. This notebook has the capability to burn both CDs and DVDs. 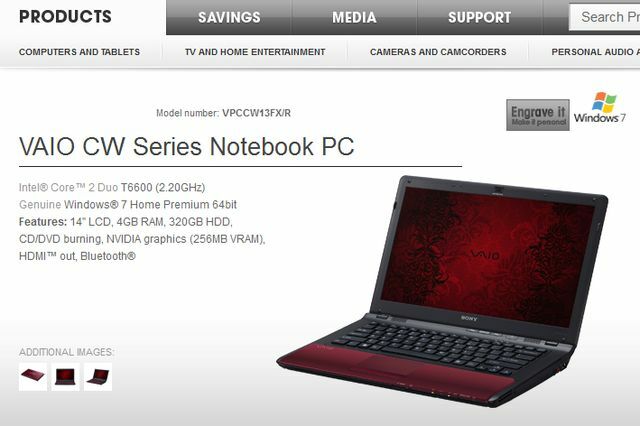 The Sony VAIO CW Series Notebook PC seems to have it all. The battery has the capability to show 2.5 hours of DVD time and the default settings for the battery runs about 4 hours. With the amount of work this Sony VAIO CW Series Notebook PC that’s a good amount of time for the features it has. Some of the features of the Sony VAIO CW Series Notebook PC includes Windows 7®, as well as easy photo software. This photo software allows you to make professional-looking movies in three easy steps. All the same time the software will help eliminate clutter and instantly sort photos and home videos by person, place or date. 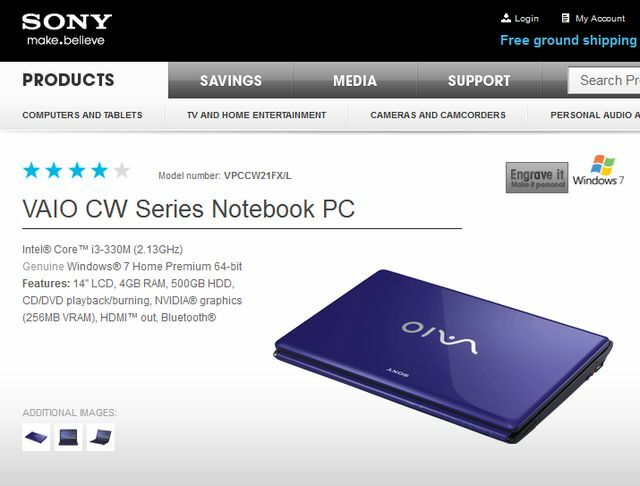 The Sony CW Series Notebook PC includes a one-touch multimedia button in the upper left corner. This powerful button will launch the VAIO Media Gallery. This software simplifies your music library so that memories of friends and family comes instantly creating instant professional slideshows of your photos. Thankfully the Sony VAIO CW Series Notebook PC comes with a one-touch support that instantly connects you to VAIO Care™ software that troubleshoots PC issues for optimum performance. There is even a “Display Off” button so that you can turn the screen off of the Sony VAIO CW Series Notebook PC. This is helpful when you need some privacy or when you need to run nighttime applications without sending your computer to sleep or hibernation. This button is usual when outputting to another monitor or TV so the image is only shown on the external display. Speaking of display…You can set this up with your television. The CW Series Notebook PC has the capability to send your DVD’s, photos, and blu-ray discs to the big screen with only a HDMI cable which is sold separately. The Sony VAIO CW Series Notebook PC has everything for almost everyone. Not only a great computer, but a great entertainment center as well. With the Sony Notebook PC you also can get one with the style of your choosing. Look at the Sony VAIO CW Series Notebook PC today as this is not your father’s laptop; it’s a way of life.